email to membership@lakersaquaticclub.org for more information. FALL 2018 REGISTRATION NOW OPEN! Lakers' Mission Statement: The Lakers Aquatic Club is an organization made up of committed swimmers, professional coaches and volunteer parents. 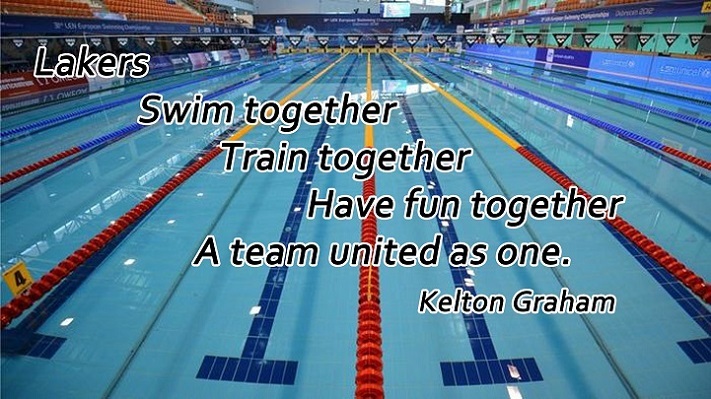 The Lakers strive to excel by assisting every swimmer in reaching their potential through a series of tools that teach them to make healthy choices, to set goals and to encourage them to push themselves beyond where they believe they can go, to instill self pride in a positive, safe, team orientated, learning environment that inspires friendships and a lifelong love of the sport. Lakers' Vision Statement: Each day the Lakers Aquatic Club is working towards becoming an elite level club. Beginning first with becoming an elite team within the state of Michigan while trying to continue to produce sectional, JR national and national level swimmers. To get last minute urgent messages regarding practice changes and meets texted to your cell phone, go to: remind.com/join/lakersa and signup for the Lakers Remind program. WATCH THIS 20 MINUTE TALK FROM HEAD COACH KELTON. HE WILL EXPLAIN HIS SWIMMING PHILOSOPHY FOR THE LAKER.